Movie Ramble: Despair: A Journey into the Light . Despair: A Journey into the Light . This was Rainer Werner Fassbinder’s first of three films in English, a language he was not fluent in, the other two were Lili Marleen (1980) and his final film Querelle (1982). It was the first time that Fassbinder had not written the screenplay, instead it was written by the British playwright Tom Stoppard who, by his own admission, was not a screenwriter and did not find the task very easy transcribing it from a novel by the Russian Vladimir Nabokov. Also this was the directors first large scale international production with a budget larger than the combined budget for his first fifteen movies. Michael Ballhous the films director of photography was quoted as saying “It was of a standard and a budget that we had never done before, a great experience for all of us (the crew) involved being able to make the film under Hollywood conditions” Unlike previous Rainer Werner Fassbinder films he had a decent amount of time allocated to shoot the film. Fassbinder, was at the pinnacle of his creativity and his ability, found himself working along side international stars the caliber of Dirk Bogarde, enticed out of semi-retirement to work with the German New Wave director, and French actress Andrea Ferreol, whose debut film La Grande bouffe (1973) had coursed quite a sensation at the Cannes Film Festival. Un-be-known to the director this beautiful voluptuous actress had to learn English to play the part of Lydia! The chocolate manufacturer Herman Herman (Bogarde) an exiled Russian, is having a mid-life crisis. His wife Lydia (Ferreol), a child woman, is in a strange relationship with her ‘cousin’, his business is on the verge of bankruptcy and the National Socialists are gaining ground. But worse still Herman is addicted to out of body experiences to the extent that he can watch himself make love to his not to bright but absolutely desirable wife. He would love to perfect this ability to double himself; in the process he meets a tramp on one of his business trips and is convinced that the man is his doppelgänger. For what he sees’s as ‘his journey towards the light’ he hatches an insane plan. 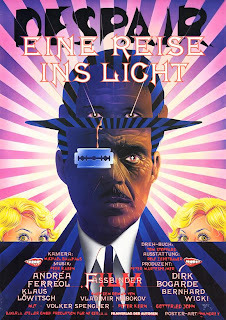 Filmed in Germany at the Bavaria Studios, except the final scenes that were filmed in Switzerland, this was Fassbinder’s 31st movie one for each year of his life, having his 31st birthday during the filming. Originally over 3 hours long it was cut by 30 minutes but the studio insisted that the film be reduced even more. Again the RWF trademarks were there, reflections with the use of mirrors and glass influenced on this occasion by the final scenes of Orson Welles The Lady from Shanghai (1947), the zoom and the tracking all imitated by the soundtrack that in it self formed an important part of this work. 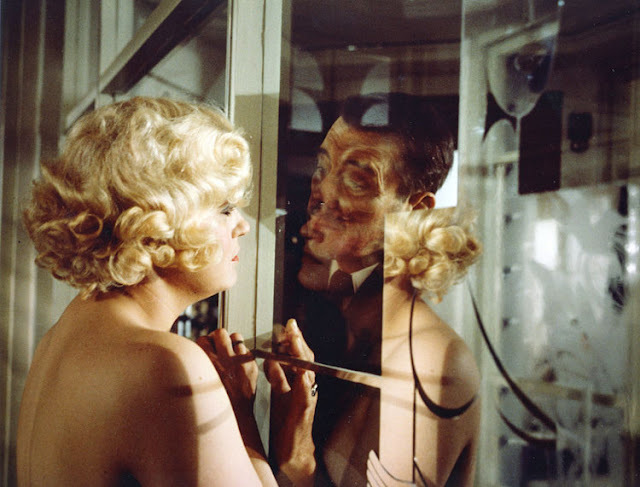 One of the reflective shots that Fassbinder's work is known for. Although the film was compared to the work of Visconti and Berman it was not a great success at Cannes, with the general public and the critics denying Fassbinder his big international break through, which he was eventually to achieve with The Marriage of Maria Braun (1978), his greatest success. Despair (1978) is available for the first time on DVD and Blu-ray, although not the original cut; but a stunning restoration by Bavaria Media all the same.